Paris is safer than many large cities, and you're unlikely to get murdered or mugged while riding the Métro or rubbernecking at the Moulin Rouge. However, the city is famous (or perhaps infamous) for its pickpockets, and scam artists--such as the String Men of Sacré-Coeur or practioners of the "Petition" Scam--can be a minor annoyance. 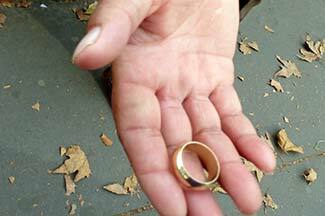 The con artist pretends to find a gold ring on the sidewalk, shows it to a tourist, and asks "Is this your ring?" 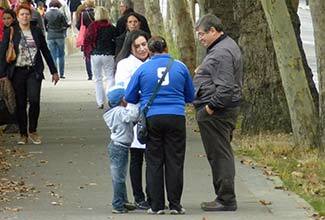 When the tourist says "No," the scammer offers to sell it. If the tourist falls for the scam, the con artist negotiates a price. The tourist ends up with a gold-colored ring made of cheap metal, and the con artist walks away with the gullible tourist's cash. Scammer: "Is this your ring?" Cheryl: "No. Did you find it? This is your lucky day!" Scammer: "You can have it for fifty euro." Cheryl: "Oh, no. You keep it. Cheryl: "No, it's yours. You're so lucky that you found it!" Most of the ring scammers don't even try very hard. In each case, we could see the con artist holding the ring in her or her palm while pretending to pick it up from the sidewalk. Ring scamming is an equal-opportunity occupation: Of the four ring scammers who accosted us in Paris recently, two were Roma women (what used to be called "Gypsies"), one was a middle-aged black man, and one was a young white man. 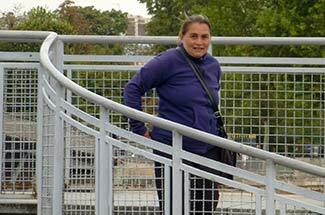 In this photo, a ring scammer (blue sweatshirt) talks to a couple on a walking path above the Seine. The child is her son or apprentice. After failing to con the couple or us (see dialogue above), the con artist goes down a staircase to look for better pickings along the quay.